Many people believe that there are lots of math facts (such as 8 x 4 = 32) that have to be memorized. There are some math facts that it is good to memorize, but children can learn math facts and commit them to memory through conceptual engagement with math. 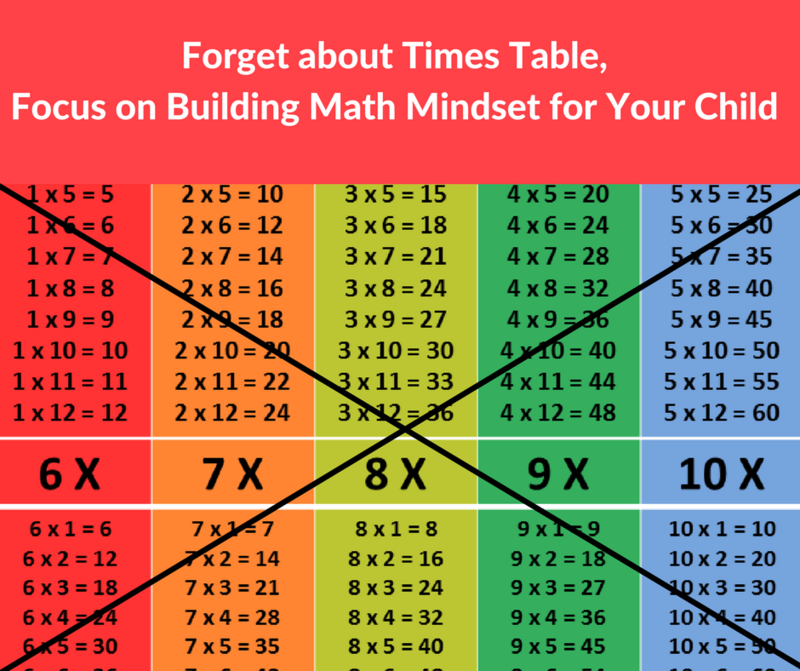 Unfortunately, most teachers and parents think that because some areas of mathematics are factual, such as number facts and times table, they need to be learned through mindless practice and speed drills. It is this approach to early learning about numbers that causes damage to children, makes them think that being successful at math is about recalling facts at speed, and pushes them onto a procedural pathway that works against their development of a mathematical mindset. Math facts by themselves are a small part of mathematics, and they are best learned through the use of numbers in different ways and situations. Unfortunately, many school & home classrooms focus on math facts in isolation, giving children the impression that math facts are the essence of mathematics, and, even worse, that mastering the fast recall of math facts is what it means to be a strong mathematics student. Both of these ideas are wrong, and it is critical that we remove them from classrooms and homeschooling environment, as they play a key role in creating math-anxious and disaffected children. But, our children do need math practice, don’t they? The question of whether or how much practice children need in mathematics is an interesting one. We know that when learning happens a synapse fires, and in order for structural brain change to happen we need to revisit ideas and learn them deeply. It is important to revisit mathematical ideas, but the “practice” of methods over and over again is unhelpful. When you learn a new idea in mathematics, it is helpful to reinforce that idea, and the best way to do this is by using it in different ways. We do children a great disservice when we pull out the simplest version of an idea and give students 40 questions that repeat it. Worksheets that repeat the same idea over and over turn students away from math, are unnecessary, and do not prepare them to use the idea in different situations. Most textbook authors base their whole approach on the idea of isolating methods, reducing them to their simplest form and practicing them. This is problematic for many reasons. First, practicing isolating methods induces boredom in students; many children simply turn off when they think their role is to passively accept a method (Boaler & Greeno, 2000) and repeat it over and over again. Second, most practice examples give the most simplified and disconnected version of the method to be practiced, giving children no sense of when or how they might use the method. We should also think about the width and breadth of the definition we are showing, and sometimes this is best highlighted by non-examples. When learning a definition, it is often very helpful to see both examples that fit the definition and others that do not fit, rather than just presenting a series of perfect examples. Children form misconceptions when shown perfect examples to the problems and practicing isolated methods over and over. They learn the method, but when they are given realistic mathematics problems or when they need to use math in the world, they are unable to use the methods. Real problems often require the choice and adaptation of method that students have often never learned to use or even think about. The PISA team at the Organization for Economic Co-operation and Development (OECD) not only give mathematics tests to students but also collect data on students’ mindset beliefs and mathematics strategies. From looking at the strategies the 13 million students use, the data show that the lowest-scoring students in the world are those who use a memorization strategy. These students prepare for mathematics tests by trying to memorize methods. The highest-scoring students in the world are those who approach mathematics looking at and thinking about the big ideas and the connections between them. One of the very best things we can do for our children is to help them develop mathematical mindsets, whereby they believe that mathematics is about thinking, sense making b, big ideas, and connections – not about the memorization of methods. So how do we develop mathematical mindsets in children so that they are willing to approach math with sense making and intuition? Before they start school, the task is straightforward. It means asking children to play with puzzles, shapes, and numbers and think about their relationships. Give babies a set of blocks, and they will build and order them, fascinated by the ways the edges line up. Children will look up at the sky and be delighted by the V formations in which birds fly. Count a set of objects with a young child, move the objects and count them again and they will be enchanted by the fact they still have the same number. Ask children to make pattern in colored blocks and they will work happily making repeating patterns. But in the early years of school we live in a system whereby children are required, from an early age, to learn many formal mathematical methods, such as those used to add, subtract, divide, and multiply numbers. This is the time when children stray from mathematical mindsets and develop fixed, procedural mindsets. This is the time when it is most critical that teachers and parents introduce mathematics as a flexible conceptual subject that is all about thinking and sense making. In Finland, one of the highest-scoring countries in the world on PISA tests, children do not learn formal mathematics methods until they are seven. In the United States, United Kingdom, and other developed countries, children start much earlier, and by the time our children are seven they have already been introduced to algorithms for adding, subtracting, multiplying, and dividing numbers and been made to memorize multiplication facts such as times table. For many children their first experience of math is one of confusion, as the methods do not make sense to them. The inquisitiveness of our children’ early years fades away and is replaced by a strong belief that math is all about following instructions and rules. According to Dr. Jo Boaler, a professor of mathematics education at Stanford University, she recommend three simple yet effective exercises to start developing mathematical mindset. The best and most important start we can give our children is to encourage them to play with numbers and shapes, thinking about what patterns and ideas they can see. Sarah Flannery, who won the Young Scientist of the Year Award for inventing a new mathematical algorithm developed her mathematical thinking from working on puzzles in the home with her dad, and how these puzzles were more important to her than all of her years of math class (Flannery, 2002). Successful math users have an approach to math, as well as mathematical understanding, that sets them apart from less successful users. They approach math with the desire to understand it and to think about it, and with the confidence that they can make sense of it. Successful math users search for patterns and relationship and think about connections. They approach math with a mathematical mindset, knowing that math is a subject of growth and their role is to learn and think about new ideas. We need to install this mathematical mindset in our children from their first experiences of math. Children need to see math as a conceptual, growth subject that they should think about and make sense of. When children see math as a series of short questions, they cannot see the role for their own inner growth and learning. They think that math is a fixed set of methods that either they get or they don’t. When children see math as a broad landscape of unexplored puzzles in which they can wander around, asking questions and thinking about relationships, they understand that their role is thinking, sense making, and growing. When children see mathematics as a set of ideas and relationship and their role as one of thinking about the ideas, and making sense of them, they have a mathematical mindset. Eddie Gray and David Tall are two British researchers who worked with children, aged 7 to 13, who had been nominated by their teachers as being either low-, middle-, or high-achieving students (Gray & Tall, 1994). All of the students were given number problems, such as adding or subtracting two numbers. The researchers found an important difference between the low and high achieving students. The high achieving students solved the questions by using what is known as number sense – they interacted with the numbers flexibly and conceptually. The low achieving students used no number sense and seemed to believe that their role was to recall and use a standard method even when this was difficult to do. For example, when students were given a problem such as 21 – 6, the high-achieving students made the problem easier by changing it to 20 -5, but the low-achieving students counted backward, starting at 21 and counting down, which is difficult to do and prone to error. After extensive study of the different strategies that the students used, the researchers concluded that the difference between high and low achieving students was not that the low achieving students knew less mathematics, but that they were interacting with mathematics differently. Instead of approaching numbers with flexibility and number sense, they seemed to cling to formal procedures they had learned, using them very precisely, not abandoning them even when it made sense to do so. The low achievers did not know less, they just did not use numbers flexibly – probably because they had been set on the wrong pathway, from an early age, of trying to memorize methods and number facts instead of interacting with numbers flexibly (Boaler, 2015). The researchers pointed out something else important – the mathematics the low-achievers were using was a harder mathematics. It is much easier to subtract 5 from 20 than to start at 21 and count down 16 numbers. Unfortunately for low achievers, they are often identified as struggling with math and therefore given more drill and practice – cementing their beliefs that math success means memorizing methods, not understanding and making sense of situations. They are sent down a damaging pathway that makes them cling to formal procedures, and as a result they often face a lifetime of difficulty with mathematics. A mathematical mindset reflects an active approach to mathematics knowledge, in which children see their role as understanding and sense making. Number sense reflects a deep understanding of mathematics, but it comes about through a mathematical mindset that is focused on making sense of numbers and quantities. It is useful to think about the ways number sense is developed in children, not only because number sense is the foundation for all higher level mathematics but also because number sense and mathematical mindsets develop together, and learning about ways to develop one helps the development of the other. Children love to give their different strategies and are usually completely engaged and fascinated by the different methods that emerge. Children learn mental math, they have opportunities to memorize math facts, and they also develop conceptual understanding of numbers and of the arithmetic properties that are critical to success in algebra and beyond. Number talks is one of the best pedagogical method for developing number sense and helping children see the flexible and conceptual nature of math. Mathematical Mindsets (2016). Jo Boaler.